9 months in the womb. 9 months out. Last week, Judah celebrated his "innie-outie" birthday, signifying that he's been alive outside of me for as long as he was in. (And can I just say that I much prefer the second nine months to the first?) He seems to be growing so fast. His locomotor skills are always catching us off guard. Now he's pulling himself up to standing, cruising on furniture, walking behind push toys, and yes, even climbed a stair last week. When I catch him doing these things, two thoughts go through my brain simultaneously. The first is something like, AW YEA JUDAH THAT'S MY BOY!! !, and the second is, OMG PLEASE JUST SIT BACK DOWN RIGHT NOW YOU ARE TOO YOUNG FOR THIS. You can guess which of those two thoughts domineered my brain last night. I was helping Luke redress after a trip to the bathroom when I heard a suspicious sound coming from down the hall. 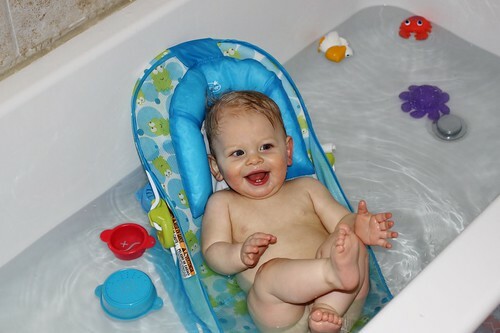 I quickly ran to the bathroom where I found Judah splashing away happily in the toddler potty. did I mention that it was full of Luke's bodily fluids? Thus we finished off our evening with baths, which nobody seemed to mind. 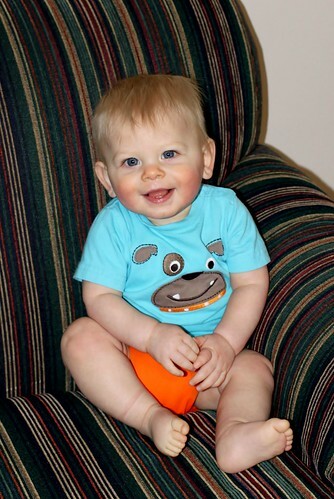 Here's another little guy at nine months - do you recognize him?